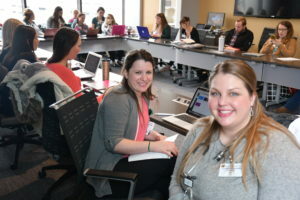 The Doctor of Nursing Practice is offered in conjunction with MU Graduate Studies and is part of a long tradition in graduate education at the University of Missouri. Family Nurse Practitioner, Pediatric Nurse Practitioner, Family Psychiatric & Mental Health Nurse Practitioner, Pediatric Clinical Nurse Specialist, Adult-Gerontology Clinical Nurse Specialist, or Nursing Leadership and Innovations in Health Care. All students pursuing the DNP degree must complete a minimum of 72-74.5 credit hours of graduate coursework. Credit hours required vary depending upon the students’ emphasis area. Up to 38 credit hours of previous graduate level credit hours from another institution may be accepted toward the total hours required for the DNP degree depending upon transcript review and applicability to the specific area of study. See your specific emphasis area sample plan of study for sample DNP Plans of Study. All DNP students must complete a minimum of 1000 faculty/preceptor supervised academic clinical hours. Post-master’s students may transfer in clinical hours completed in their previous master’s degree pending approval of their academic advisor. Total number of clinical hours may vary depending upon the student’s emphasis area, proof of national certification in an advanced practice role, and previous graduate clinical coursework completed. The DNP Residency project is a faculty-guided scholarly experience that provides evidence of the student’s critical thinking and ability to apply research principles through identification of a significant practice problem, systematic appraisal of relevant scientific literature and outcome data; design of cost-effective, evidence-based, therapeutic interventions or programs; successful implementation of the selected interventions or program, and comprehensive evaluation of specific, measurable, and appropriate outcomes. The project will reflect the culmination of knowledge and skills developed during the DNP program. The Graduate Student Handbook provides a complete description of the DNP scholarly project .